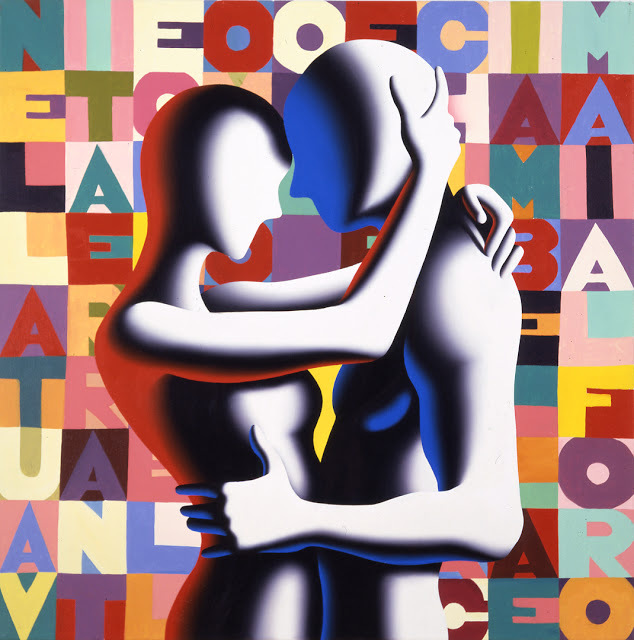 Mark Kostabi is among the most interesting artists of the contemporary art scene. His works are exhibited at the Guggenheim, the MoMA, the National Gallery of Modern Art in Rome and in other prestigious museums. 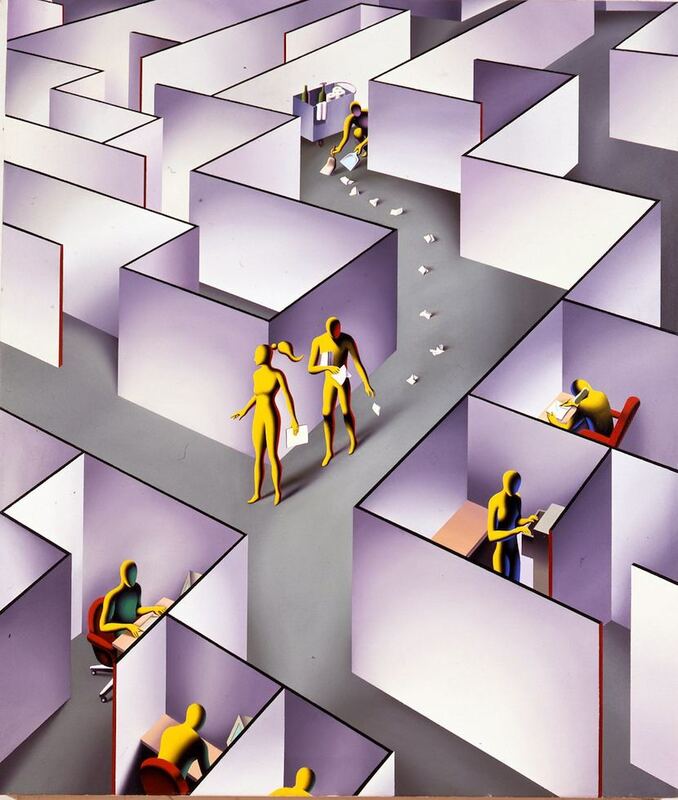 In 1988 he founded the Kostabi World, a studio where several assistants collaborate in the creation of his works, quite on the pattern of the Renaissance workshops. In his paintings flow various patterns and techniques, ranging from the influences of the Italian Renaissance paintings, Surrealism, and Andy Warhol’s Factory, all masterfully reworked in an unmistakable and unique style. 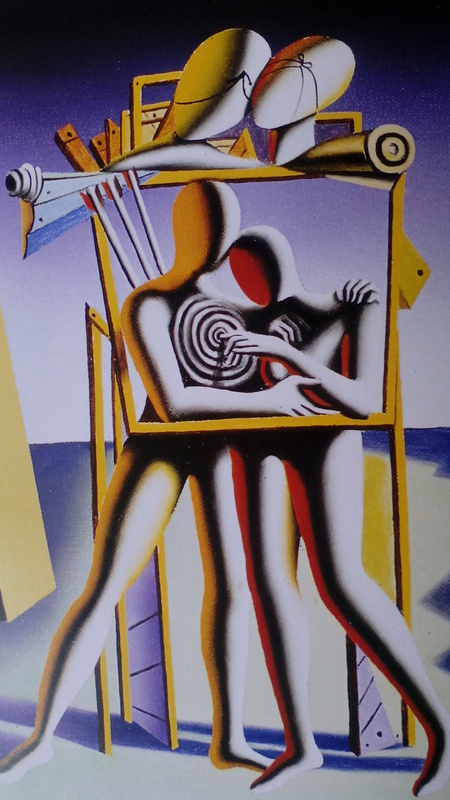 It is impossible to see Kostabi’s painting and not recognize his signature. 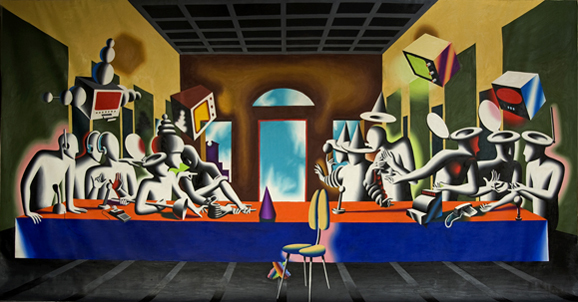 The pervasive use of the media as a theme and engagement with – collaborating with MTV, CNN, and Kostabi also directs his own TV show – and the peculiar method of production that is carried out by his assistants reminds us of the «work of art in the age of mechanical reproduction», to use Walter Benjamin’s words. 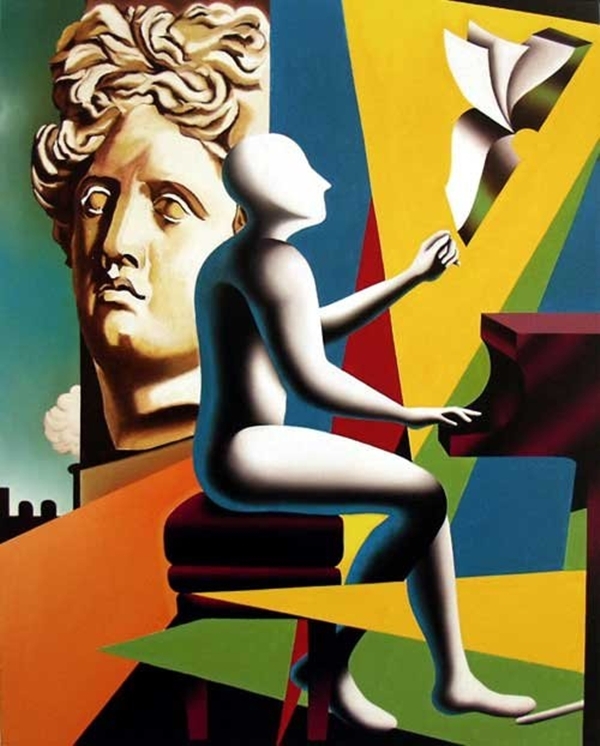 Kostabi goes beyond limiting parameters and available technologies, often in an ironic way, and yet using tradition as a context though always renewing it. Such renovation within the tradition takes place in typically postmodern ways, such as citations and self-citation. 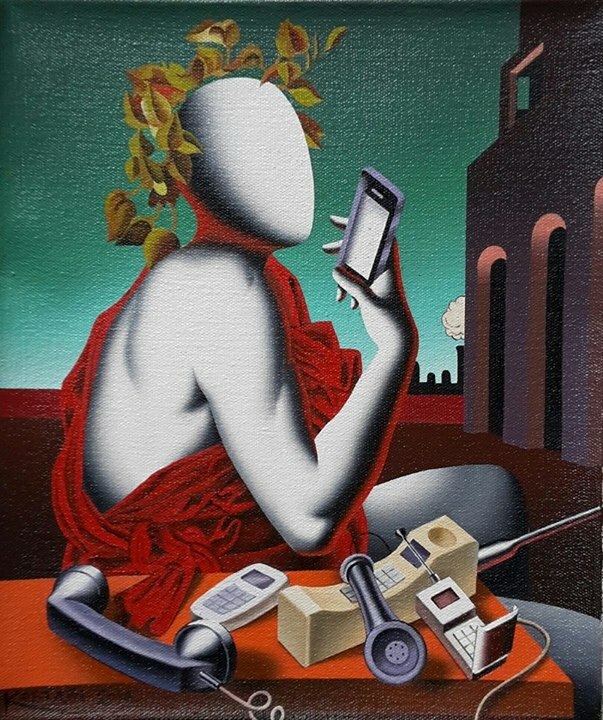 The blend of genres and techniques in his paintings makes numerous reference to other works, it is perhaps impossible to list them all. 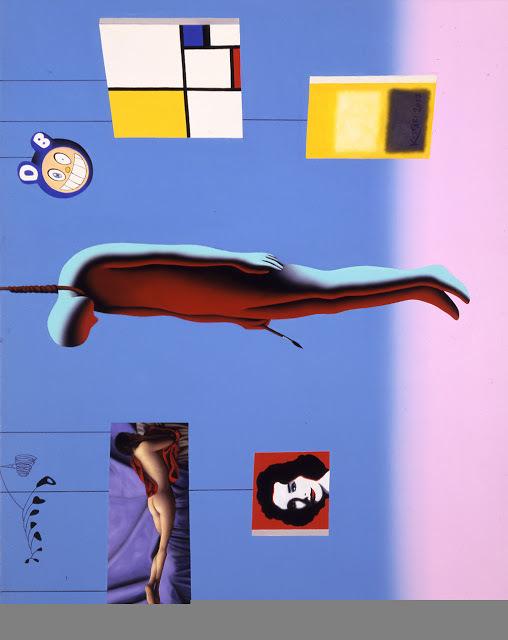 The works of Kostabi are a kind of unconscious collective artistic archive: it is as if the labyrinthine repertoire of images were collected by a single author, who reassembles this fragmented dimension, but always proposing faceless characters and timelessness, perhaps a symbol of a common humanity running through art. Your subjects, almost all faceless , androgynous and placed in a rarefied dimension, recall De Chirico’s mannequins, but in your works they became sensual and capable of love. 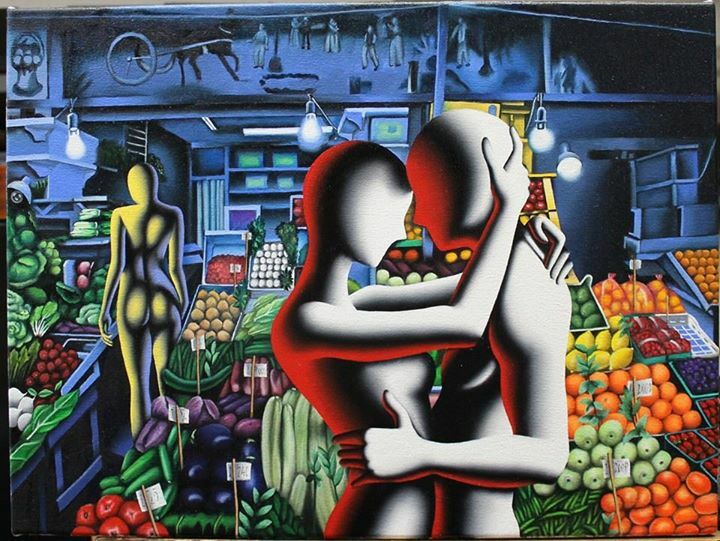 This is quite evident in your painting called On Target in which two lovers are born of De Chirico’s mannequins, but they seems to replace them. Is that so? And why? «I love De Chirico’s work but ultimately I’m from California, which has nothing to do with De Chirico. I grew up in right wing conservative Whittier, California, but I was schooled by liberals at California State University, Fullerton by brilliant teachers like Don Lagerberg, Connie Zehr and Vic Smith. And I agree with the liberals. De Chirico embraced the poetry of silence. I embrace the poetry of Frank Zappa and Miley Cyrus». In many of your paintings an ironic criticism is shown against the obsessive use of information technology and television. A use that distorts the primordial instincts of the human being as well, as in Sexting and The Penultimate Punctuation. At the same time, you are known for a wide use of mass information and television, such as your TV show. How do you combine these two different attitudes? «I blame technology for nothing. I only report images that I see that involve technology. A family at a dinner table: not speaking to each other, each focused on their own Galaxy Note or iPhone. But at least they’re reading, typing and communicating. They’ve escaped the obligatory boring family ritual. 30 years ago, without smartphones, they would be arguing and killing each other. Facebook equals world peace». In The Drawback a painter paints a picture and the picture paints the painter. What is the relationship between the creator and the creation of an artwork? «The creation continues creating. Only I’s die. Every painting is a universe of immortality». You’ve painted the covers of the Guns ‘N’ Roses album Use Your Illusion I and II. Would you like to tell us something about this experience? «It was fantastic. 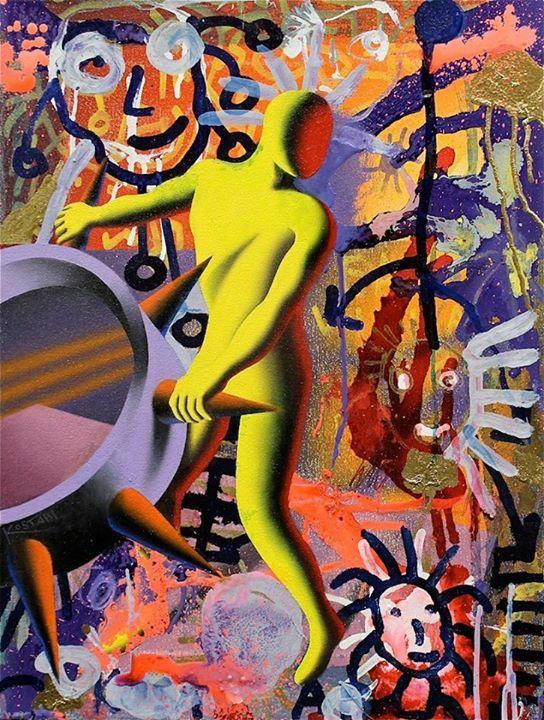 Axl Rose walked into Hanson Gallery on Rodeo Drive in Beverly Hills, California and bought my painting titled Use Your Illusion (my brother Paul Kostabi gave me the title.) 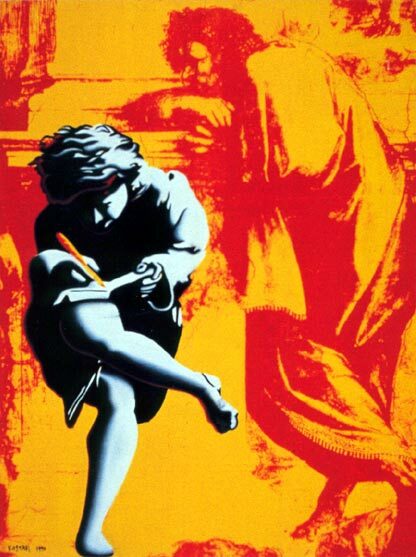 Axl’s manager called me and said Axl was writing songs about illusions and wanted to use the painting on his new album cover and also wanted to use my title: Use Your Illusion. We negotiated a happy deal and it made rock history. 36 million copies sold and it helped me get a few beautiful young girlfriends». 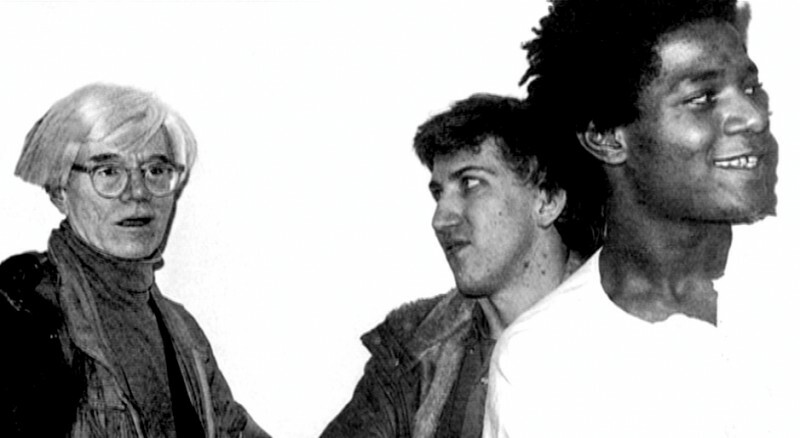 What did meeting with Andy Warhol and Basquiat give you? «Warhol was great! He gave me positive encouragement. I was very star struck meeting a living legend like him. He was a genius. Basquiat was a sort of genius too. Certainly a great artist. With me personally, Basquiat was nice and quirky. I should have bought some of his work back then. I saw him many times at events and I visited his studio once and we made a collaborative drawing. It must be somewhere in the archives». I have read some articles which speak about the economic difficulties you had at the beginning of your career. Could you tell us something about that? «I never really suffered. I was late paying the rent often and had to eat 25 cent packages of Ramen noodles for lunch during my first year and a half in New York. But I was in ecstasy because I was in the city of art. With my unwavering determination and focus I ignored the hardships of normal everyday life. Art saved me and continues to this day». What advice would you give to young Italian artists who, in these times of great crisis, want to achieve their dreams? 2. Live in New York. 6. Get other people to work for you. 8. Don’t forget your friends». According to you, is it possible succeed in life and work while remaining faithful to noble ideals and principles? «I think that’s the only way it’s possible to succeed. Cheating is the first step to failure. Negativity is death of the soul». What do you think about the condition of the Italian culture? «That’s a big question and I’m sure most intellectual Italians would approach it differently than someone like me — a middle class kid from southern California who moved to New York in 1982 with dreams to become a rich and famous artist. I’m not an expert on Italian culture, even though I’ve lived in Italy since 1996. But what I mean is, I don’t really know much about D’Annunzio. I saw a few Fellini films years ago. I met Sophia Loren a few times at the restaurant Antica Pesa in Trastevere and I’ve gotten to know a lot of great musicians through Tony Esposito, like Enzo Gragnaniello, Pino Daniele, Antonello Venditti and Edoardo Bennato. I also know the great painter Enzo Cucchi rather well. And I knew Enrico Baj and Mimmo Rotella. Also Giancarlo Politi, Achille Bonito Oliva and Bruno Colella. But I don’t feel like an expert on Italian culture and I don’t know what condition it’s in. I sure love Rome though. And I love hanging out at Camponeschi in Rome with some of the protagonists above, at Umberto Scrocca’s Electronic Art Café, Aperitivi d’Arte on Thursday nights». What question would you have liked that I asked you in this interview? And what answer would you give? «What is the secret to happiness? Answer: Be in love with lots of hugs and kisses. And if that’s not possible, have clean sheets and at least four high-quality pillows in your bed to hug with a well-charged cell phone and good facebook access. 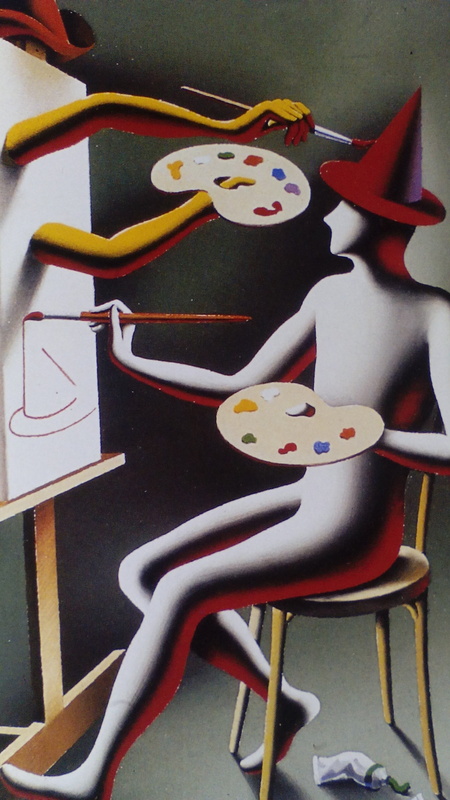 And watch The Kostabi Show at www.thekostabishow.com». Tag: cover Adios Amigos! 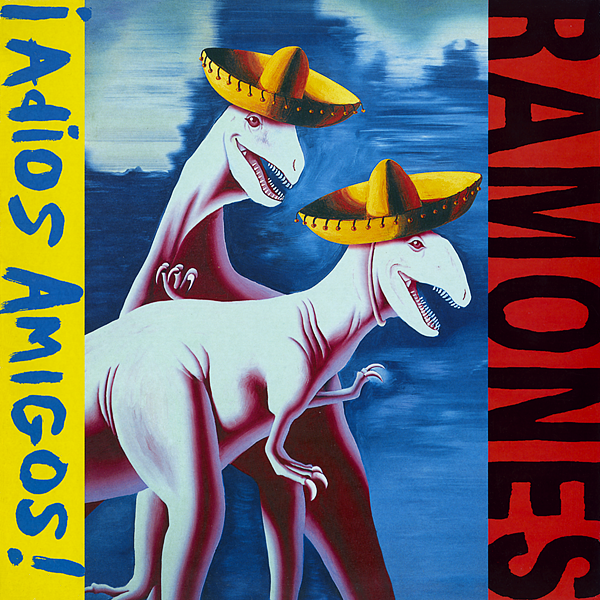 Ramones, cover Use your illusion, Guns 'N' Roses, Kostabi World, Mark Kostabi, On target. Aggiungi il permalink ai segnalibri.